Nigerian Biography: Biography of Murtala Mohammed; Former Military Head of State of Nigeria; Kano State Celebrity. Biography of Murtala Mohammed; Former Military Head of State of Nigeria; Kano State Celebrity. 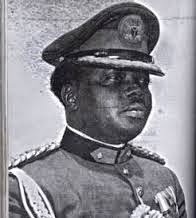 General Murtala Ramat Mohammed (deceased)was born in Kano State Nigeria, on November 8, 1938. On July 30, 1975, Brigadier (later General) Mohammed became the head of state after a coup that ousted General Gowon from office. On February 13, 1976 Murtala Mohammed was assassinated when he was only 37 years of age, alongside his aide-de-camp, Lieutenant Akintunde Akinsehinwa, in an abortive coup attempt led by Lt. Col Buka Suka Dimka. His car was ambushed on his way to his office at Dodan Barracks, Lagos. When the coup failed, Olusegun Obasanjo replaced him and brought his plan for an orderly transfer to civilian rule to completion by handing over power to Shehu Shagari on October 1, 1979.